Earlier this month, I took a trip to New York for a week to interview for some jobs and do some stand-up. I’m a big coffee snob, so of course, I had to write one of my “top coffee shops” lists that I’ve done for Berlin, Paris, Dubai, and Europe in general. Then I got to thinking, I’m a pretty big foodie, so I should probably be doing posts about food as well. I love a good cheap but luxurious snack, and what better place to find those than NYC. I did a lot of research before, to find all the popular places, but then found more by walking by or asking my Airbnb hosts. So without further ado, here is my list of the best (moderately) cheap eats in New York City. NY is famous for their bagels and I had a lot of them. I went to a variety of shops that ranged from kinda good to super delicious. Ess-A-Bagel was super delicious. The smell of freshly baked bagels was wafting through the air and I was overwhelmed by all the flavors and spreads I can choose from. I ordered an everything bagel, which was doughy and massive, with plain creme cheese. I audibly moaned, because it was so good, and it was really weird for the people around me. Though I try to stay away from donuts, I do not do a very good job of resisting. This was one place I knew I would have to indulge myself in, what with their funky and unique variety of donuts. I grabbed a cup of coffee from Third Rail by Washington Square Park and then spent a bit too much on a maple bacon donut. It blew my freakin mind. Not so sweet that it made my teeth hurt and perfectly dense and crispy. These donuts make me go nuts. I passed this place on my walk home to my Airbnb in East Village and it definitely was fate that I end up there. 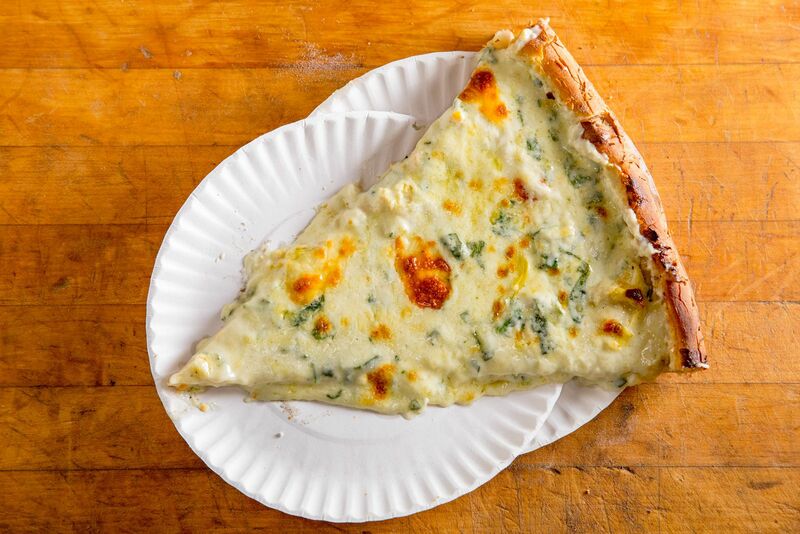 This pizza joint is famous for their massive slices of creamy artichoke pizza. It was packed with hungry customers and I found a corner in the back where I could burn my mouth eating this pizza (because I was too impatient to eat.) DEFINITELY GO HERE IF YOU LIKE PIZZA!!!! Chances are if you’re a foodie, you have seen photos of these ice cream cones on Insta. Well, actually I think they’re more like works of art than actual ice cream. The cones themselves are vibrant colors. I had a bright pink, coconut macaron cone with vanilla soft serve, pink chocolate drizzle, and rainbow sprinkles. It was not actually cheap (it was $9) but I would pay it again because it’s that dang good. They also have wild ice cream cones that they top with slices of cheesecake, ice cream sandwiches, or about fifteen scoops of various flavors. They really take ice cream to the extreme. This cup of hot chocolate changed my life and probably my waistline too. It was very rich and flavorful, with a giant cube of fresh marshmallow plopped on top. 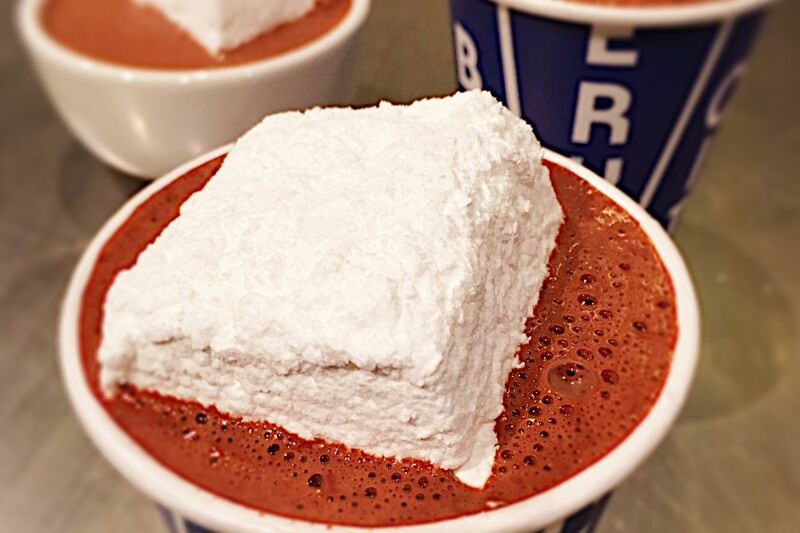 But ohhhh when that marshmallow began to soften and melt…that’s when it really got good. If you’re into hot chocolate, this has to be one of the first places you go because you will never think of hot chocolate the same. I could go on and on about the food in New York but I have to stop myself now because it could get really out of control. I tried to balance out the ridiculous excess of calories by walking as much as I could, which resulted in me walking nearly 40 miles in a week. It didn’t really help. But, oh lord, it was so worth it.